Jeju has a long and colorful history but, unfortunately, very little of it has been published in English. Many of its historical anecdotes are entertaining – mixtures of fact and fancy – and hold a place not only in modern Jeju society but mainland Korea as well. One such tale is the Queen of Tamna. I first read about the Queen of Tamna in an 1888 report to the American State Department by 46-year-old Charles Chaille-Long, the Secretary at the American legation in Seoul. Long was a curious man and always seeking excitement – sometimes to his detriment – and in the fall of 1888 set out to explore Jeju Island. From what he had read and heard, he was convinced that, unlike the rest of the country, Jeju still possessed the remnants of the Mongolian invasions and occupation in the 13th and 14th centuries. Long’s journey to Jeju Island was published in previous issues of The Jeju Weekly but failed to include his meeting with Jeju’s governor, Shim Won-taek. Long described Shim as being a few years his senior and possessing clean cut features with a “face clearly of the Tartar type, although somewhat obscured by a pair of huge spectacles of smoked glass.” Regal in his court uniform of colored silk and black hat made from felt and ornamented with a peacock feather and other insignia of his high office, he seems to have made a favorable impression upon Long. 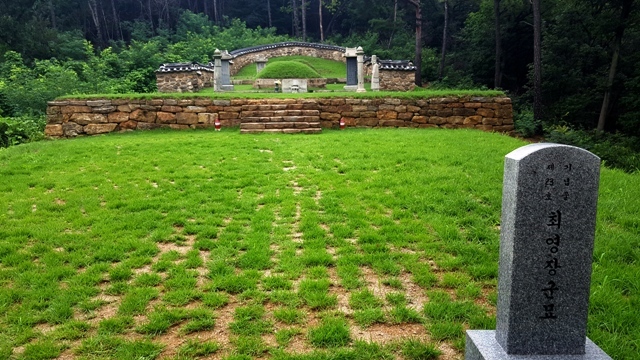 Long, still seeking knowledge of Mongolia’s role in Jeju’s past, asked Shim to tell him the history of Jeju Island and, particularly, of the Kingdom of Tamna. Much to his surprise and delight, Shim obliged and shared with him the tale of how Tamna was lost and Jeju began. It is an interesting tale and not confined just to the island. According to Shim, from that day on, the island’s name was changed from Tamna to Choi-ju [Jeju] – in honor of the fallen general. In 1749, the governor of Ganghwa Island proposed planting thorny trees from Jeju near one of Ganghwa’s fortresses. He had once served in Busan and while there had heard about the great battle between the “woman leader” of Tamna and General Choi. The thorny trees had hindered the general’s attack upon the woman’s stronghold and it was only after they had been set afire was the general able to break through and defeat her army. She was subsequently beheaded. A Busan variation of the legend claims that the queen was spared because of her beauty and forced to become Choi’s concubine. She eventually came to love him and when he was banished from court and sent into exile, she was told that he had been sent to Yeongdo Island. Determined to be with him, she went to the island only to discover that he was not there – she had been lied to. (He had actually been sent to Goyang – just outside of Seoul.) In a fit of depression, she committed suicide. But her han – (described by Suh Nam-dong as “a feeling of unresolved resentment against injustices”) was strong and her vengeful ghost haunted the island killing off the horses in the royal stable. A shrine was built and seems to have appeased her spirit for one still stands there today. 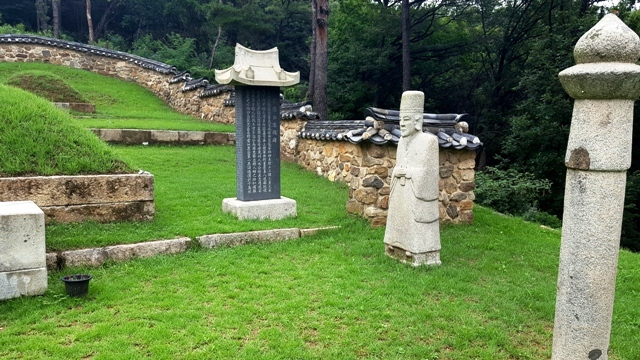 The Queen of Tamna legend is based upon the fierce battle in August 1374 when the Goryeo force of 25,600 men led by General Choi Yeong (1316-1388) – one of Korea’s greatest military leaders – defeated the Mongols and their allies and forced them from the island. One well-known and popular legend claims that Choi used giant kites to fly over the thorny barriers but this tale mentions no queen. If there was a queen we will probably never know her name but her death was not the only one in this tale to be surrounded with mysticism. Choi fell from grace during the final years of the Goryeo Kingdom and was executed. Just before his death, he swore he was innocent of wrongdoing and foretold that no grass would grow upon his grave as proof. Believe it or not, up until 1976, his grave remained grassless – a bare red clay mound known as Jeokbun (the Red Grave).